“Craftivism” is a new term in my lexicon and it’s one I’m rather excited about. It is quite literally, the merging of craft with activism and it appears to be to bounded only by creativity. Graffiti has a long history with politics and social justice yet craft is an entirely different beast, one typically perceived as a woman’s pastime intended for decorative or functional purposes. As a result, most would agree that knitting is a form of crafting but would draw the line in calling it an art- form and would likely be rather uncomfortable with the suggestion that it has the potential to influence anything beyond the number of toes nibbled by frostbite. While knitting certainly has a utilitarian background, it can be stitched into any shape or form thereby allowing the the knitter to ascribe their own purpose and intention. When knitting is thoughtfully constructed and intentionally placed in the public sphere it has surprising power to draw attention to a range of political issues in a non-threatening manner. The Manolis L was a paper carrier ship that sank off the coast of the Change Islands in Newfoundland, Canada in 1985 and has since begun to leak oil. The culture of outport Newfoundland is closely tied to the sea, and the impact of inaction towards the Manolis ship is not lost on local citizens; 150 of whom gathered in protest this January in Twillingate. 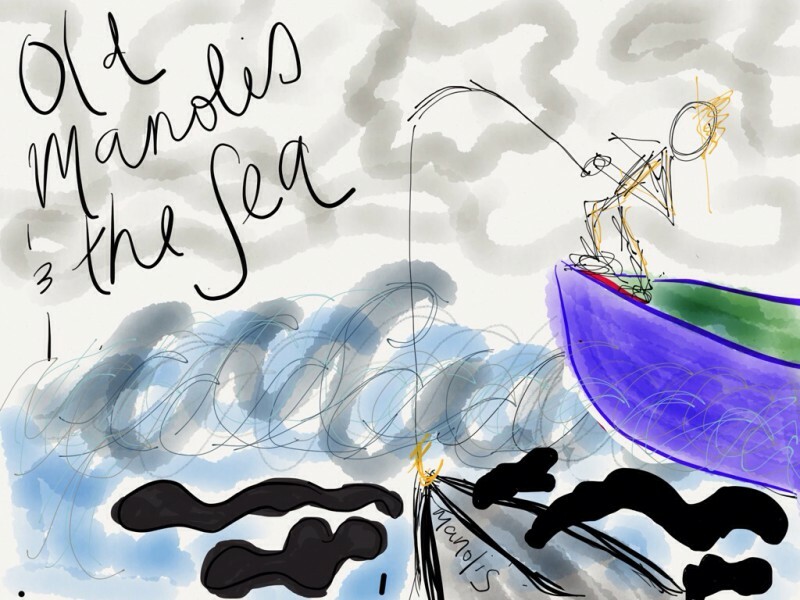 “Old Manolis and the Sea” is a project I have designed to unite the ideas discussed above. I am in the process of knitting a black starfish and plan to place it in a high traffic area near the ocean as a daily, visual reminder of the presence of oil and its effect on sea life. Star fish are widely considered good bio-indicators of marine eco-systems thus my goal is to include other symbols with a more natural colour scheme to serve as a stark contrast to the black. This project will be stitched in wool which will eventually decompose and breakdown in the elements, reminding us of the natural cycle of all things including the hull of the Manolis ship. While there is a dark ‘undercurrent’ to this piece I aim to make it beautiful and eye catching and strive to develop a way to link to this blog, where people can get informed and inspired to take collective action towards addressing the inconvenient reality that is the Manolis L.
Please feel free to comment on how this resonates with you.